This course is perfect for the non-medical professional, employed as a camp counselor/chaperone, recreational staff, volunteer park interpreter, outdoor guide/educator for whom first aid delivery is often a secondary responsibility or as a second rescuer for a higher trained person. 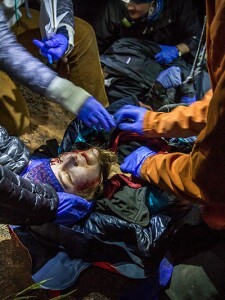 The emphasis of the class is on recognizing and treating life-threatening traumatic and medical emergencies common on shorter backcountry trips that are relatively close to help with shorter response times from Search and Rescue or EMS. This course can easily be tailored to meet your organizations needs. Current WAFA card holders can take an additional 40-hour WAFA bridge course to receive an 80-hour Wilderness First Responder (WFR) certification.